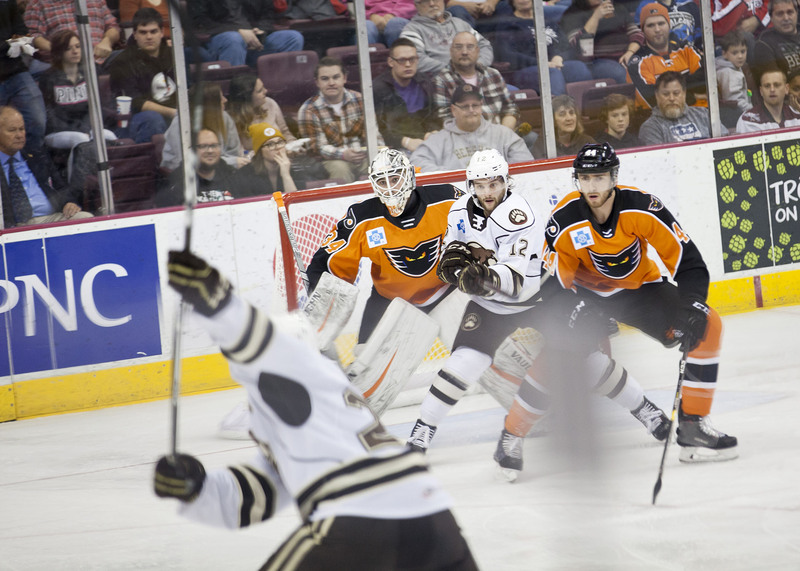 The Hershey Bears fell to the Lehigh Valley Phantoms 6-1 Saturday night at Giant Center in Hershey. The loss drops the Bears record to 12-17-0-2 on the season. The Bears will now break for the holidays and return to action on Friday when they face the Penguins in Wilkes-Barre. Puck drop is set for 7:00 PM. The Phantoms struck first early in the opening frame but Riley Barber would tie the game with less than two seconds remaining in the opening stanza for a 1-1 tie at the first intermission. Lehigh Valley would add two quick goals in the first five minutes of the middle frame to take a 3-1 lead early in the second stanza. The Phantoms would quickly add another for a 4-1 lead at the second intermission. The Phantoms would add two more in the final frame for the 6-1 final. Photos from the game are here. Scratches: Lucas Johansen (upper body), Connor Hobbs (upper body), Shane Gersich (upper body), Brian Pinho (lower body), Max Kammerer (lower body), Jame Linhart (upper body), Kris Bindulis (upper body) and Tobias Geisser (World Juniors). The Phantoms would strike first with a snipe from the left side by Tyrell Goulbourne at 5:44 of the first frame. Goulborne’s shot beat Samsonov glove side. In the waning seconds of the opening frame, Riley Barber let one fly from the top of the slot to tie the game with less than two seconds remaining in the period. Ryan Sproul was credited with the lone assist. The period would end tied at 1-1. The Phantoms outshot the Bears 9-3 for the first 20 minutes. The Bears were 0 for 1 and the Phantoms 0 for 0 on the power play in the opening frame. The Phantoms would regain the lead early in the middle frame with a goal from Zach Palmquist at 4:17 of the second period. The Phantoms would quickly make it 3-1 with a deflected goal by Tyrell Goulbourne at 5:50 of the second period, making it 3-1. The Phantoms would stretch their lead to 4-1 with a goal from Carsen Twarynski at 14:45 of the second period. The second period would expire with the Phantoms leading 4-1. Both teams had 10 shots on goal in the middle frame. There were no power plays in the period. The add another tally midway through the final frame to make it 5-1. Taylor Leier knock home a dirty goal at 9:03 of the third period. The Phantoms would quickly make it 6-1 with a shot right off of a faceoff by Taylor Leier at 11:25 of the third period. That would be the final. The Phantoms outshot the Bears 11-9 in the final frame. This entry was posted in News and tagged Hershey Bears, Lehigh Valley Phantoms, Riley Barber. Bookmark the permalink. Samsonov needs some time in the ECHL, he’s clearly not ready for AHL.